Both sets are two tone glitter acrylic sculpture extension. The colors don't really show up here. In fact, the orange glitter is really bright! Love it! 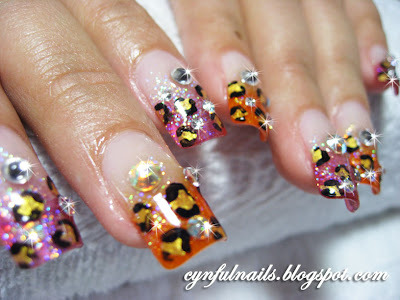 Alternating between pink and orange glitter, then painted on gold leopard prints. And of cos, blings! So glossy and bling! Leopard prints are damn IN now. hahaha. 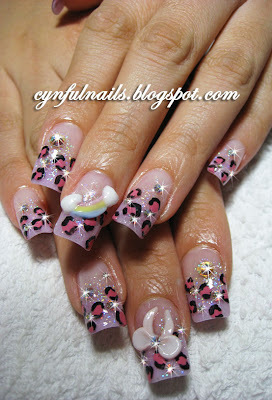 Light pink purple glitter with pink leopard prints. So kawaii! Rainbows and ribbons on both thumbs n middle fingers. 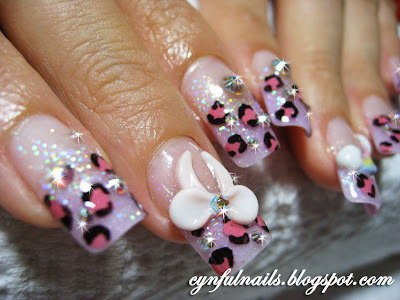 Now I think I might just do this on my nails for CNY. Then again, I might just be too tired and lazy.